Pioneer’s brand-new SGY-PM900H79 cycling power meter offers new technology for real-time and very detailed pedal stroke analysis. So while pedaling may seem like the most natural motion to cyclists, and even I rarely gave it much thought, what I learned with Pioneer's pedaling analysis was an eye opener. Cycling is dictated by the rigid and repetitive motion of turning the cranks, making an optimal interface between the body and bike crucial. However, pedaling is such a simple thing that most cyclists never think about it. Thinking it through though, any little improvement in the biomechanics can go a long way to improving overall comfort and efficiency, along with decreasing the risk of injury. 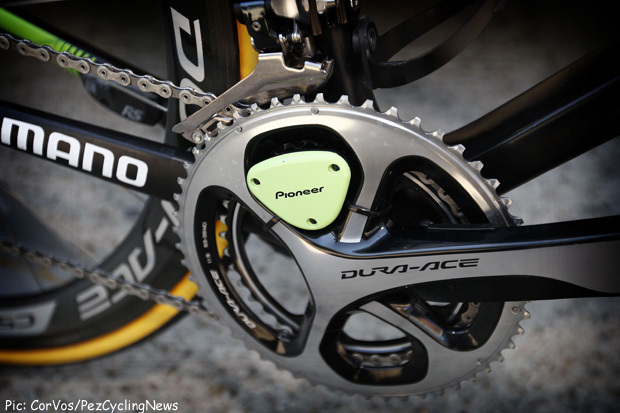 Pioneer's new power meter system is poised to advance the power measuring game in cycling. Just how smooth is our pedal stroke? We all have heard about the idea of unweighting your leg during the upstroke so that you aren’t fighting against the opposite leg on the downstroke. We have also been told to visualize scraping mud off our cleats to train this motion. Do we actually do this in reality? Similarly, we know we each have a strongly preferred throwing arms, but do we have preferred pedaling legs? And how much of any discrepancy is due to anatomy, muscle imbalance, or bike fit? The short and long answer to these questions is simply that we just don’t know. That’s because, outside of research laboratories with specialized and custom-built force plates or strain gauges on each pedal, cyclists haven’t really had the technology to quantify their pedaling stroke in real-time or out on the road. This is true despite the proliferation of power monitors, as all previous crank-based systems consist of a single set of strain gauges within the crank spider, in the bottom bracket, or on one but not both cranks. So while software processing can help to parse out the contributions of each leg, such calculations remain indirect and subject to lots of built-in assumptions. This is all starting to change now with new pedal-based power monitors, featuring independent set of strain gauges within each pedal. And amongst crank-based systems, I’ve been fortunate enough to be one of the first to get to test out the brand new Pioneer SGY-PM900H79 power meter, which was tested and battle-hardened throughout 2013 by the Blanco/Belkin WorldTour team. The unique aspect of the Pioneer is that, rather than a single set of strain gauges, there are independent sets of 4 strain gauges on both the right and left cranks. 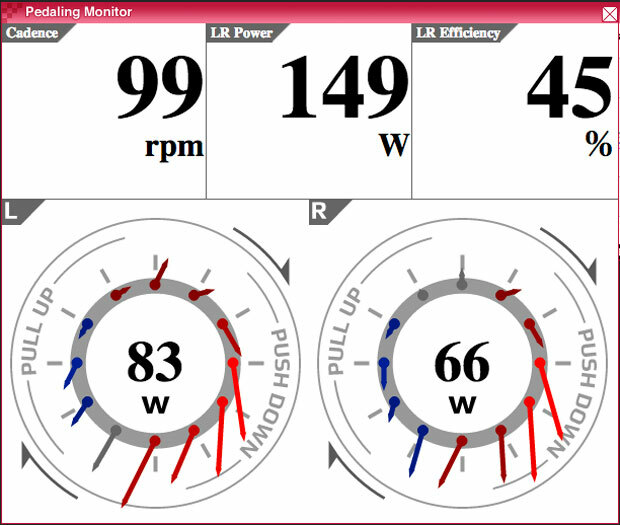 This gives the raw data for the accompanying SGX-CA900 cyclocomputer and www.cyclosphere.com web-based training software to provide a wealth of analysis that goes well beyond the “basic” power data that we have become familiar with. A full review of the Pioneer system will be coming on Pez. However, even after my first couple of rides, I found out things about my cycling that are incredibly interesting in terms of new insights and paths to improvement. The first ride I did with the Pioneer was a “microburst” interval workout on the TruTrainer rollers, consisting of repeated 20 or 30 s efforts at 330-350 W with similar recovery. The second ride I did a steady endurance ride with a few 1 min maximum cadence segments. While the use of rollers (hey, it’s -10oC with huge wind chill and snowy roads outside) may not perfectly simulate outdoor riding, they likely do so better than a clamped stationary trainer. How to Read the Graphs? •	The two circular graphs represent the force of the left and right legs. Pioneer averages the force over 12 segments of 30 degrees each. •	The arrows represent the magnitude of the force in each segment and also the direction. What you really want is to have the arrow direction perfectly tangential (i.e., at top dead centre, you’d like a very long arrow pointing perfectly to the right). •	A red colour represents positive force that is actually turning the cranks forward. A blue colour, on the other hand, is force that is negative or pretty much turning the pedal backwards. Grey shows neutral force. The first mode of riding to analyze is just what happens with steady riding at an endurance pace and normal cadence. For the sample below, here I am riding at about 100 rpm and 150 W, using a 50x21 gear. 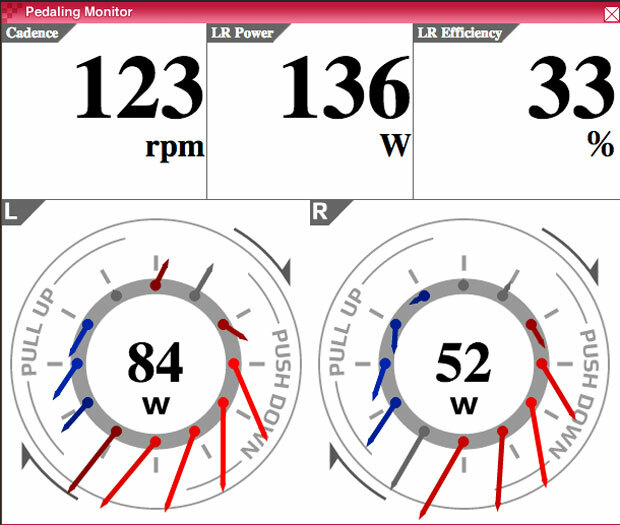 •	Look at the huge discrepancy in the power being generated by my left leg (83 W) versus my right leg (66 W). •	See also the pattern of force generation with my left leg. It’s really quite good, with red through the 11 o’clock zone and also at 12 o’clock or top dead centre. 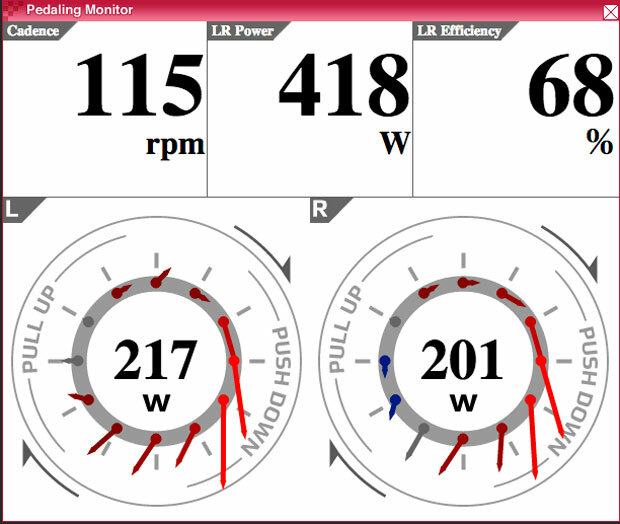 The second graph here shows what happens when I’m riding hard at high wattage and cadence. •	I didn’t pick the most representative sample to show here, but the L/R power discrepancy was usually about 30-40 W.
•	Both legs smoothed out their force pattern much more than at an endurance pace, though the left leg remained more efficient. The next type of riding to analyze is what happens when riding a big gear at lower cadences, the kind of riding that you might do when riding up a gradual climb. Here I am riding at <90 rpm while riding at a tempo pace. Sounding like a broken record here, but again there’s a very big left-right imbalance in power output and in pattern of force. The last example we’ll play with is when I pretend to be a trackie warming up on the rollers, doing a maximal cadence spin at low wattages in a small gear. 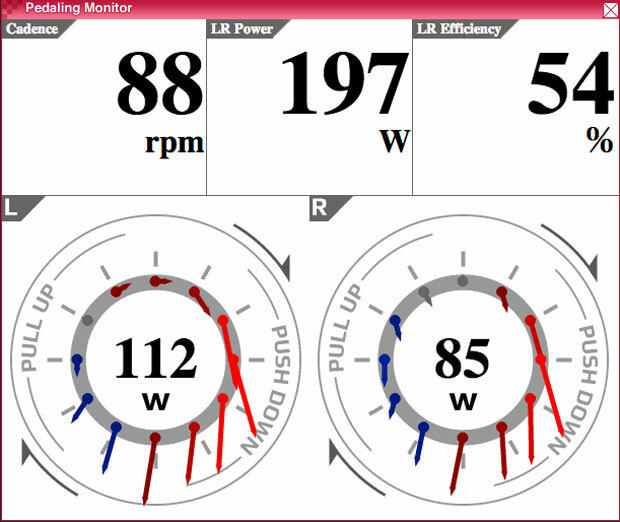 The power discrepancy here is huge, with the left leg often >50% stronger than the right. Also, both legs become pretty choppy in their force pattern. In my view, there is a whole new frontier of information available that is unleashed by the opportunity to independently analyze each leg’s pedaling stroke. For me, obviously the biggest eye opener was the large discrepancy in power output between my right and left legs that was consistent in all the types of riding I’ve tried and shown here. Second is the equally consistent discrepancy in force pattern, with the left leg much more productive than the right. A good amount of the extra power produced by the downstroke of the left leg is being wasted by fighting against the poor force pattern of my right leg. If I can improve the right leg’s pedaling, even without increasing its power, that’s more of my current power going to actually turning the cranks forward. To balance the power output of my right and left legs, a bike fit to check for leg-length discrepancies may be important. If there is a leg-length discrepancy, this could also contribute to the difference in force pattern between my legs. Improving my right leg’s power output through isolated leg training, both on and off the bike, may also be important. I hope that this helps to show you the importance of thinking about your pedaling and figuring out ways to improve it, both from a performance and a muscle balance and potential injury risk perspective. I also hope you see as much potential with this new wave of power analysis as I do. I will be keeping you updated as I learn more myself, and will also be presenting a full review of the Pioneer power meter system shortly. In the meantime, have a terrific 2014! Stephen Cheung is a Canada Research Chair at Brock University, and has published over 60 scientific articles and book chapters dealing with the effects of thermal and hypoxic stress on human physiology and performance. Stephen’s Cutting-Edge Cycling, a book on the science of cycling, came out April 2012, and he can be reached for comments at [email protected] .